- The Federal Reserve left interest rates unchanged on Wednesday and said it would stop its balance-sheet reduction programme in September amid concerns over slowing growth both domestically and abroad. The Federal Open Market Committee left its overnight funds rate in a range of 2.25% to 2.5%. 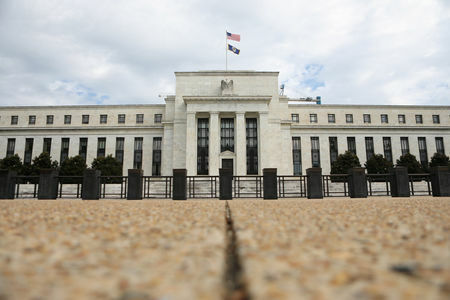 The decision on rates was widely expected as Federal Reserve members, including Chairman Jerome Powell, have repeatedly stressed that a wait-and-see approach was needed to assess the health of the U.S. economy. But in an unexpected move the Federal Reserve also signalled that no rate hikes would be appropriate for 2019. Members of the rate-setting committee reduced their 2019 median forecast for interest rates to 2.4% from a previous estimate of 2.9%, hinting at no rate hikes for 2019. That's below the two rate hikes previously indicated in the Fed's December projections. Fed watchers had only expected the Federal Reserve to lowered its expectations to a single rate hikes for this year. The interest-rate outlook for both 2020 and 2021 were lowered to 2.6% from 3.1% previously, while the longer run interest rate was maintained at 2.8%. That has raised investor expectations the central bank may be close to reaching neutral -- a level of rates that neither stimulates nor restricts the economy. The dovish outlook on monetary policy was attributed to signs of slowing U.S. economic growth even as the labor market remains strong. Fed policymakers cut their outlook on U.S. economic growth for 2019 and beyond. "Information received since the Federal Open Market Committee met in January indicates that the labor market remains strong but that growth of economic activity has slowed from its solid rate in the fourth quarter," the Fed said in a statement. The economy is expected to grow by 2.1% in 2019, down from 2.3% previously, and by 1.9% in 2020, down from 2.0% previously, the Fed's Summary of Economic Projections showed. The pace of inflation, meanwhile, is forecast to cool to a rate of 1.8% in 2019, down from a previous estimate of 1.9%. While core-PCE inflation for both 2019 and 2020 is expected to meet the Fed's 2% target. Traders are expected to shift attention to Fed Chairman Jerome Powell's press conference at 2.30 PM ET (18:00 GMT), for more insight into the central bank's thinking on monetary policy. Ahead of the press conference, GrantThornton said it expected to Powell to get peppered with questions on measures the Fed could adopt to tackle a potential wobble in the economy. "(W)e expect the chairman to be asked what the Fed has in its tool box, should the economy falter," said GrantThornton Chief Economist Diane Swonk. "He has previously stated that negative interest rates are a possibility. The FOMC has yet to decide on this latter point but will be examining the issue along with the optimal size and composition of the balance sheet."